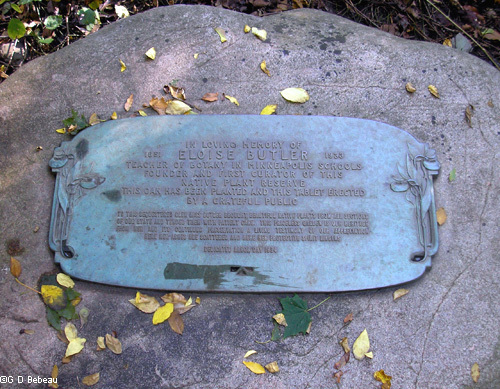 The Memorial Tablet for Eloise Butler was dedicated on Arbor Day, May 4th, 1934. The idea for a memorial tablet is mentioned in the April 19, 1933 minutes of the Board of Park Commissioners and was spoken of at the memorial service on May 5, 1933. It was planned, created and presented by some of her friends and some of her former pupils from her years as a botany teacher in the Minneapolis Public Schools. A committee of these persons, headed by Clara Leavitt, had been formed at the suggestion of Theodore Wirth, General Superintendent of the Minneapolis Park System, in mid-1933 following Eloise's death. The committee was known as the Eloise Butler Memorial Association. There were several suggested dedications which were submitted to Martha Crone (who replaced Eloise as Garden Curator) for her approval and for her to sample the preferences of garden visitors as to the wording. A fund raising campaign was initiated with the suggested donation being limited to no more than one dollar. The committee felt that they must raise the funds independently so as to "prove to Mr. Wirth and the Park board that the Reserve (The Wildflower Garden) has many friends." (1) The dedication as shown below, being the one recommended by the committee. Martha and all interested others approved and the bronze tablet was cast, using the design of a Mr. Melchior of Flour City Iron Works. PDF: Documents about the Committee, contributors, Newspaper Articles. On April 30th 1934 Superintendent Theodore Wirth sent a brief memo to the Board of Park Commissioners that on Arbor Day, May 4, the dedication ceremony would be held and that the Memorial Association had invited the Board and its officers to attend. 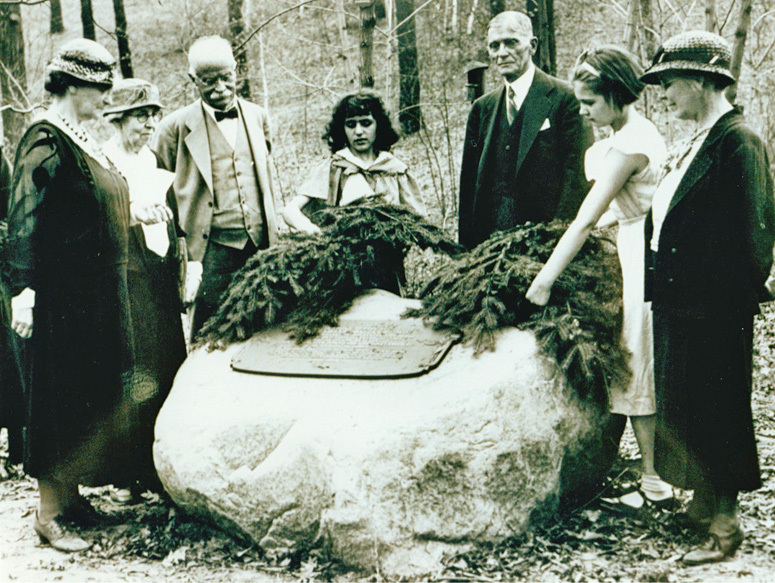 The program outline was that Miss Elizabeth Foss (North High teacher) would present the tablet; an original poem would be recited by Mrs Florence Hadden (former pupil); Miss Jennie Hall and several children would do some bird calls; and Francis Gross, Vice President of the Board of Park Commissioners would accept the tablet. (PDF copy of documents). Above: Click on the tablet image for a larger photo. 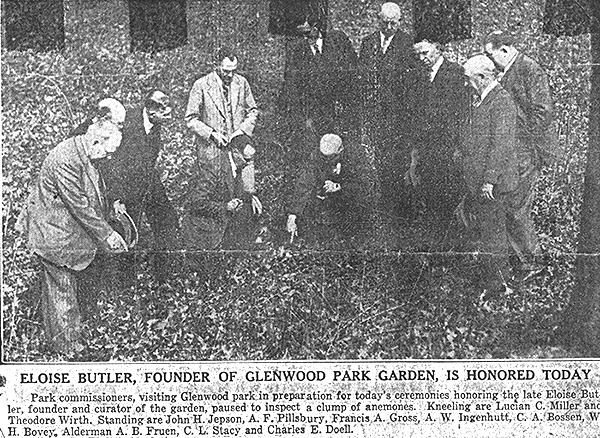 Below: Prior to the dedication ceremony the Park Commissioners, the Superintendent and the local Alderman visit Glenwood Park.